Calendula - Simple Magic in your Garden! Calendula – Simple Magic in your Garden! Calendula is a rather unassuming magical flower found in abundance in most gardens. Most of us would correctly identify calendula as a marigold. What you might not know is that there are many different species of marigold that don’t have the same benefits for skin and hair as the commonly known “pot marigold”. This hearty plant usually flowers orange and gold and has a distinctive aroma. The flower closes its petals when it looks like rain and when the sun starts to set, and then opens them again at dawn to welcome the morning light. It also helps repel pests in the garden making it not only a lovely flower to look at, but also a working plant helping to keep your garden organic and pest free. In the years that I have planted a border of calendula around my garden, there were no aphids and little to no other pests! In years where I decided not to plant a calendula border, I’ve had to work much harder to keep the garden pest free. Antioxidant: Calendula has been found to have powerful antioxidants as well as compounds like C-reactive protein and cytokines. While we can’t explain the benefits of these powerful constituents due to FDA regulations, a quick google search to a trusted science base resource can aid you in understanding the importance of these compounds. Soothing: Calendula is so soothing it’s often found in hemorrhoid cremes and diaper ointments! Youth Serum: Calendula also contains carotenoids. These protect from environmental stressors and also soothe the skin. 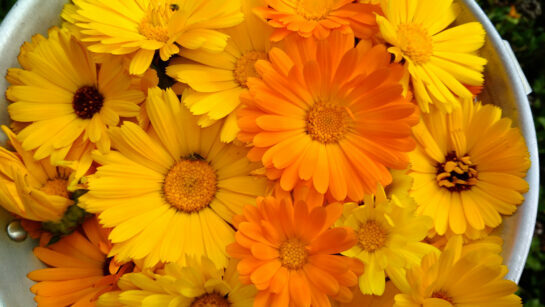 Carotenoids naturally exist in the skin, so calendula may also improve skin’s appearance. Ready to give Calendula a try? Check out this great recipe for Antioxidant Cooling Eye Gel! The delicate skin around the eyes is especially sensitive to our environment, and blue light emitted by our computer screens is no friend to keeping eyes looking fresh and youthful. This eye gel harnesses powerful antioxidants to combat environmental stress and keep the eye area looking bright and fresh! Pour all ingredients into a mixing bowl or beaker and blend with a stick blender. Test the pH of your eye gel. It should be between 4.5 – 5.5. Please see our video on how to test pH if you need further instruction on how to measure and adjust pH. No need to add preservative – the Simple Cucumber and Cranberry Gel is preserved as well as the tinctures. Please note that this formula has not been challenge tested for preservation efficacy. If you use this formula for market sales, it is up to you to ensure the safety of the product.